A faulty heat exchanger (cracks or rusted through) can leak combustion by-products (including carbon monoxide) into the house. It should be inspected annually. Forced warm air heating systems. How it works. 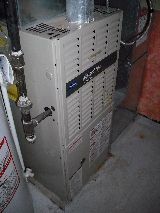 Mid or high efficiency furnace. Heat exchanger. A warm air heating system, fuelled by gas, oil or electricity, does two jobs. First, heat is produced by burning fuel in the combustion chamber or through electrical resistance. Secondly, heat is transferred through the heat exchanger and the distribution system to the living areas of the house. To squeeze the maximum amount of heat out of a fuel that is burned in a combustion chamber, gases are pushed through a maze-like pathway from the combustion chamber to the chimney. By the time this mixture of heated air and combustion by-products reaches the chimney, most of the heat will have been conducted through the metal walls of the pathway. (There is no need of a chimney for high efficiency or condensing furnaces). These walls are an excellent conductor of heat. The process is called heat exchange. The combustion section of the furnace (the fire box, burner and heat exchanger path) is itself enclosed in a large sheet metal box or casing. When fuel burns in the combustion chamber, the delivery system does not go to work immediately. There is a reservoir of air within the furnace casing as well as in the planum (the sheet metal 'box' that sits on top of the furnace). This air must be heated to an acceptable level before a heat sensing control, housed in the planum, starts the furnace's air circulating fan. At this time warm air will begin to flow through the duct system for distribution throughout the house. When the room temperature reaches the setting of the thermostat, the the furnace burner shutts off. The air circulating fan does not shut off until the temperature within the air reservoir or plenum drops to a predetermined level. Later, when the temperature drops, the burner will ignite and the cycle will begin again. This is the typical cycle of a forced warm air furnace.